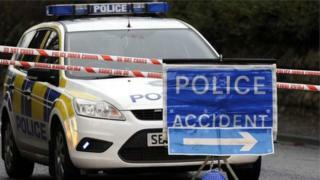 A number of people have been injured and a horse killed after two cars struck the animal on a road near Ballymena. The incident happened shortly after 04:00 GMT on the Lisnevenagh Road. Police said that a Vauxhall Vectra hit the horse before a second car then collided with the animal. "The driver of the Vauxhall sustained injuries that, while serious, are not thought to be life threatening," said Insp Peter Duncan. "The five occupants of the second car sustained only minor injuries." The road has since reopened. Police have appealed for information.